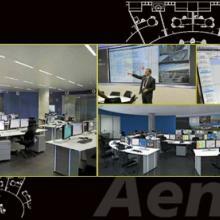 AENAs new control center in Son San Joan Airport is already working. Located on the sixth floor of the terminal building of the airport of Palma de Mallorca and with the objective of improving the optimization of resources, the CGA will take charge of controlling all the operative movements in real time of airships, passengers, baggage, infrastructures and information systems. The project was awarded to INDRA, who has trusted the experience of GESAB in this type of projects, to carry out the conceptualization, integral design and execution of the construction project and installation of the CGA of Mallorca. The control center has been endowed with the most leading technological solutions in control centres, being guaranteed the continuity and sustainability of the facilities. The use of systems of professional back projection as a technology Videowall LED of the lastest generation and the good administration of the computer teams with the installation of KVM solutions, together with the ergonomics level obtained in the facilities, present in the technical interiorism, illumination, technical furniture and positions of operators, they make of the Centre of Administration Airport of Son Sant Joan one of reference at national and European level.